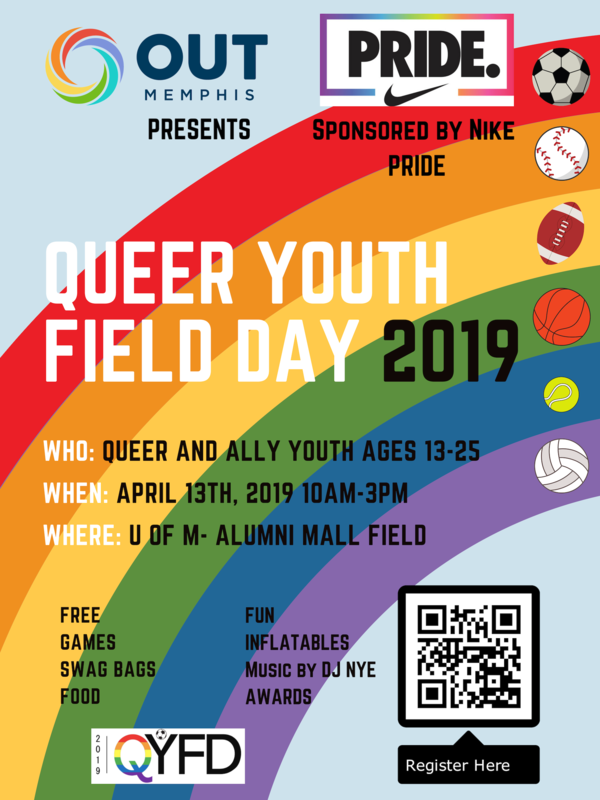 Queer Youth Field Day is a FREE annual OUTMemphis event sponsored by Nike Pride. Our goal is to offer a fun, safe and supportive environment for all LGBTQ and Ally youth ages 13-25 to be active and have a chance to meet other like minded youth. In addition to the games we will be playing, there will be food, music, awards and resources available for youth. The first 80 individuals to pre-register are guaranteed a Nike swag bag! Come OUT and join us for a fabulous day! For more information you can contact us or visit the Facebook event. 13-25 years-of-age and want to participate? Over 25 and want to volunteer? Any other medications, knee braces, etc. If you have any questions or concerns, please contact us via email! Do I have to be LGBTQ to participate? You do not need to identify as LGBTQ to participate. You do, however, have to be respectful of all individuals present. If we see any participants harassing, bullying or giving another individual a hard time they will be asked to leave. I am an adult looking to be a volunteer, what should I do? Thanks for your interest in volunteering! Please use the button above to sign up as a volunteer. Do parents have to stay? Parents do not have to stay but they are more than welcome to. Even better, feel free to sign up as a volunteer using he button above!